You've just gotten into learning about electric bikes? Great! We've crafted articles from our staff and our brands to help make your decision easier and to increase your purchasing power. Never knew your frame size or how much exercise you'll get from an electric bike? You can find out here. We love riding our bikes. 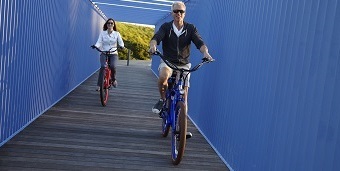 There's no better way to get around West Michigan than on an Electric Bike. That being said, sometimes it's hard to come into the shop to review the latest and greatest. That's where we come into play, giving you reviews for you to enjoy in the comfort of your own. So, electric bikes sound pretty great...right? Of course! But there are some things to know before jumping into your next new form of transportation. Before buying, you'll at least want to know the basic options, like the motor, battery, and modes of acceleration. From there, you can get as technical as you desire. How do you pack down a 50-pound electric bike? What's the best bike to travel to work? Are there electric fat tire bikes? So many bikes, so many questions, so little time. So, we've broken down the four main bike types into different articles to help figure out the best bike for you. An e-bike needs maintenance, just like any other bike. There are some things you'll want to do every day, every week, every month, and every year. If you ever feel as if you need help maintaining your bike, definitely stop into our shop or your local bike technician to make sure you're riding with the best performing possible. Electric skateboards are one of the coolest ways to get around town! Traveling at a top speed of 18 - 22 miles per hour, you can skate to work, school, or downtown without having to always worry about kicking. This page will focus on reviews, technology, and maintenance.